Sitting in the foot of the Lauterbrunnen valley below much vaunted Wengen and Murren, Lauterbrunnen often gets overlooked in favour of it's famous neighbours. However, anyone wanting a cheaper and even quieter alternative to Wengen and Murren should have a look into it. And if you plan to ski more than one of the Jungfrau Ski Regions areas you'll find Lauterbrunnen handily placed. Like other resorts in the Jungfrau region it has a strong tradition of families returning to holiday here year after year, and with the sort of scenery that's on hand, along with the tranquillity, and the hospitality, you can see why. Lauterbrunnen - The Good, the Bad, ...and the Facts! Dramatic location in the U-Shaped Lauterbrunnen Valley. Jaw-dropping Jungfrau scenery when you reach the slopes above Wengen and Murren. Cheaper alternative than staying in Wengen or Murren. Good base if you are planning to ski both Wengen and Murren's ski areas. 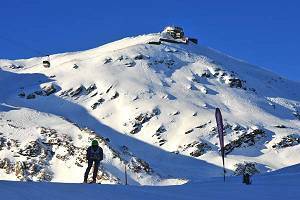 Getting to the slopes is obviously slower than staying in one of the above resorts. 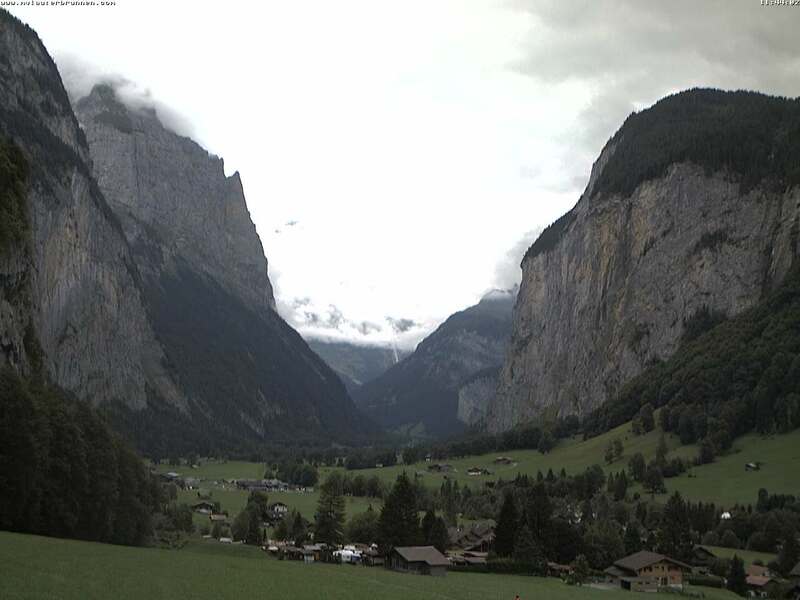 A list of webcams for Lauterbrunnen and the surrounding area. Lauterbrunnen webcam - view down the Lauterbrunnen valley from the edge of the village. Given it's location in the bottom of the valley, Lauterbrunnen's snow record isn't as good as Wengen or Murren, but assuming you're coming here to ski then it's the snow records of those two resorts that you're going to be interested in anyway. 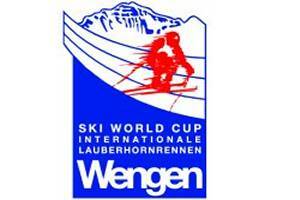 For more details have a look at the resort pages for Wengen and Murren. The resort itself is family friendly, mainly because it's so peaceful. However, those with small children need to be aware that they face a bit of a trek to get up to the slopes above Wengen or Murren. It might not be sat high up on a ledge like neighbouring Wengen or Murren with views directly over to the surrounding mountains, but Lauterbrunnen's scenery is equally stunning. Sheer cliff faces drop down vertically either side of the valley bottom, creating the most incredible U-shaped valley (so perfect a geography teacher would most probably feint on seeing it), with enormous waterfall's either frozen or hurtling water down from the mountain's above. And being based at the bottom of the valley you really get a sense of the incredible scale of the Jungrau range that towers over everything. Any Summer Skiing at Lauterbrunnen ? Surprisingly, given the size of the mountains that are surrounding Lauterbrunnen, you can't actually ski anywhere in the summer. The Eiger has a glacier (the Eigergletscher) and from the visitor centre at the top of the Jungfraujoch you're right next to another one, also the largest glacier in the Alps - the Great Aletsch Glacier (Grosser Aletschgletscher) but there are no lifts or skiing on these. Instead, Lauterbrunnen and the Jungfrau area turns its attention to a whole host of other outdoor activities during the summer months, such as hiking, climbing, paragliding and water-sports down on the lakes near Interlaken. Consider travelling by train - it takes about 3 and a half hours from Geneva with changes required at Bern and Interlaken Ost. This may sound like a long time and a lot of hassle changing but it's worth it. It's a fantastic journey around Lake Geneva to start with and then the final legs as you hit the Bernese Oberland. Firstly, you need to be aware that this is an old-school bottom-of-valley resort. Don't get mixed up into thinking that this will be like one of the modern purpose built resorts in the French Alps, with an ultra-fast gondola zipping you up to higher resorts. Lauterbrunnen has a history and an identity of its own and getting up to Wengen and Murren involves using the traditional trains. Ok, so the train may be slower than a lift but just sit back and enjoy those stunning views. However, don't believe some of the stories you'll hear that you'll waste half your holiday travelling to Wengen or Murren - it's not that bad, and with a little bit of basic planning (e.g. looking at the train timetable and getting yourself out of your hotel at a decent time) you can be in either resort within 30 mins. A list of piste-maps for Lauterbrunnen and the surrounding ski areas. The three big Jungfrau resorts - Wengen, Murren and Grindelwald are notoriously laid back. Lauterbrunnen is no different. It's an ideal resort if you are looking for somewhere quiet, perfect if you have a family and are wanting to avoid the après-ski maelstrom of some other resorts ! Lauterbrunnen - Any Chance of Early Snow ? This spectacular ski race was started back in 1928 by 5 Brits from Murren's Kandahar Club and now has an important place on the annual ski calendar as one of the biggest and most popular amateur ski races in the world. The course is just under 15km long, starting just under the Schilthorn (think James Bond On Her Majesty's Secret Service at 2790m and finishing right down in the valley at Lauterbrunnen 2000m vertically below. The winner hurtles down in about 15 minutes but there's plenty of competition - with up to 1800 skiers taking part. The event has become big business for the village of Murren, with other events in the lead up and a massive Swiss party afterwards. The 2016 race will be the 73rd running of the event. The Silberhorn Hotel is located in the Lauterbrunnen valley with breathtaking views of the Jungfrau mountains and the world-famous Staubbach Falls. It is in a quiet off the main street but only 150m from the railway station which takes you to the skiing and hiking areas.